Can a strategic Social Security filing plan really lower the taxes you pay in retirement? For some, yes! Your retirement tax bill – the total amount of taxes you’ll pay in retirement – largely depends on how your retirement income is structured. It was one of my Dad’s biggest retirement shockers. He didn’t expect to pay so much in taxes. Yet there it was…a big tax bill in the first year of retirement. Like a lot of other retirees, he didn’t know that up to 85% of his Social Security benefit could be included as taxable income. Ultimately, we were able to mitigate some of his tax burden, but for some of it, he was stuck. He didn’t like it and he’s not alone. Every year individuals retire and are faced with sticker shock when they find out how much tax they’ll have to pay in retirement. However, there are some strategies that could help you reduce the amount of your taxable Social Security income. Before we dig into those strategies, let’s review the rules on Social Security taxation. To some, it doesn’t seem fair. You’ve worked for years and paid your Social Security tax as the admission ticket to a Social Security benefit. Now that you’re collecting that benefit, you have to pay taxes? Again? At first, Social Security benefits were not taxable. That all changed with the passage of 1983 Amendments to the Social Security Act. Under this new rule, up to 50% of Social Security benefits became taxable for certain individuals. 10 years later, the Deficit Reduction Act of 1993 expanded the taxation of Social Security benefits. Under this Act, an additional bracket was added where up to 85% of Social Security benefits could be taxable above certain thresholds. The combination of these laws left us with the current tax structure on Social Security benefits. Today, somewhere between 0% and 85% of your Social Security payment will be included as taxable income. In order to determine how much of your Social Security benefits will be taxable, you first have to calculate “provisional income” – a measurement of income used specifically for this purpose. Provisional income can be roughly calculated as your total income from taxable sources, plus any tax exempt interest (such as interest from tax free bonds), plus any excluded foreign income, plus 50% of your Social Security benefits. 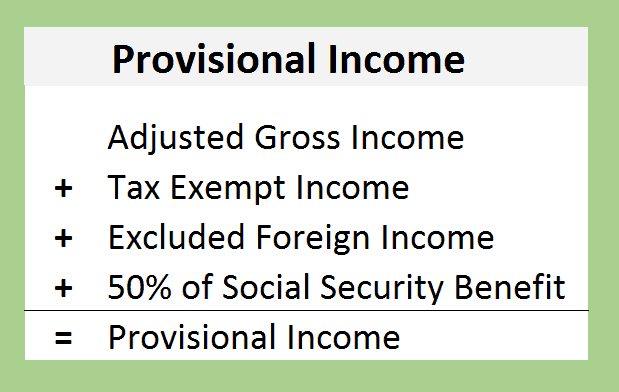 Once you’ve calculated your “provisional income” you can apply it to the threshold tables to determine what percentage of your Social Security will be included as taxable income. If your total “provisional income” is less than $32,000 ($25,000 if single), none of your Social Security benefits will be taxable. However, if your are married and your total exceeds $32,000 ($25,000 for singles), then 50% of the excess is the amount of Social Security benefits that must be included in taxable income. If your provisional income exceeds $44,000 ($34,000 for singles), then 85% of the excess amount is included in income. That can seem confusing so let’s look at an example. Tim and Donna are both 66 years old. They have some rental property that generally averages $12,000 in net annual income. Their combined Social Security Benefit will be $3,000 per month ($36,000 p/yr). In addition to this income, they will take an annual distribution from their IRA in the amount of $32,000. 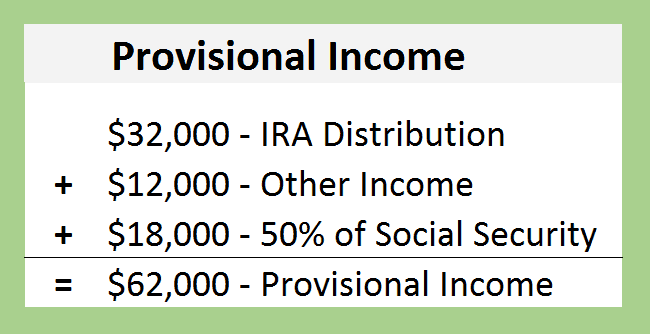 Using the income from those sources, here’s how the provisional income would be calculated. Remember that only 1/2 of your Social Security income is counted. Now that your provisional income is calculated, it’s time to find out how much of your Social Security benefit is taxable. Based on a married couple with a provisional income of $62,000, it’s now a simple matter of applying the income to the thresholds. The first $32,000 of your provisional income has no impact on whether or not your Social Security benefit is taxable. 50% of the amounts between $32,000 and $44,000 will be added. 85% of the amount in excess of $44,000 will be added. As a rough calculation, an individual with a provisional income of $62,000 would have $21,300 of taxable Social Security income. Since you can only spend the dollars you keep, you need to be familiar with the rules about when and how much you may pay in tax on your Social Security benefit. You don’t have to be a tax expert…I know I’m not. I understand enough to know how to do a rough calculation. You should too. Now that you have a rough idea of how to forecast your taxable income from Social Security, you are in a much better position to understand the mechanics of potentially reducing your retirement tax bill. When viewed through a long term perspective, taxes in retirement may be one of your greatest single expenses. Any move to lower that expense will result in an increased spendable income. 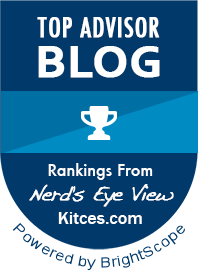 Although your tax advisor is the best resource for recommendations on an overall tax reduction plan, there is one strategy that is really easy and often overlooked. It’s a simple matter of structuring your income. If you can reduce your provisional income, you should see a corresponding reduction to the amount of your Social Security that is counted as taxable income. Let’s take a look at the Andersons and the Wilsons. See the chart below for sources of income. At first glance you may notice that each couple is receiving $80,000 per year in total income from all sources. You’ve probably also noticed that there is a difference in the amount of Social Security income and 401K/IRA distributions. It’s not because one couple has a higher Social Security benefit than the other couple. Actually, both couples have the exact same full retirement age benefit. I’ll explain that later. For now know that although there are several similarities, there is one big difference. The taxes they’ll pay. Through a strategic Social Security filing plan the Wilsons were able were able to structure their income in a way that saved them big dollars in taxes through the course of their retirement. In fact, when compared to the Andersons, the Wilson’s saved $31,372 in taxes and took $43,520 less out of their IRA. And remember, everyone received the same amount of income! How did this happen? It’s not magical or tax evasion. It’s just good old fashioned Social Security strategy. Each couple began retirement at age 66 with a need for $80,000 in total income. Each couple also had Social Security benefit of $36,000 at full retirement age. The Anderson’s elected to file as soon as they reached full retirement age. This way their income was fairly level from all sources. The Wilson’s had a different approach. At Mr. Wilson’s full retirement age he filed and immediately suspended his Social Security benefit. This allowed Mrs. Wilson to file a restricted application for spousal benefits only. The idea was to increase each of their benefit amounts by 32%. At age 70, they both began receiving their own benefit which had grown to $47,520. The nuts and bolts of this strategy is simple. Remember that only half of your Social Security income is included on your “provisional income” calculation. By increasing the amount of income from Social Security, and a corresponding reduction elsewhere, the amount of total taxable income should decline. This was certainly the case with the comparison above. There may have been some short term pain while the Wilson’s were taking more from their IRAs, but it’s easy to make the argument that it was well worth it. Even though the Anderson’s are receiving considerably less in Social Security income than the Wilson’s, the Anderson’s are having more of their Social Security benefit included as taxable income! The key to this approach is to recognize that not all income sources are equal. Prior to making any retirement decisions, you should have a basic understanding of how each income stream will be exposed to taxation. Not knowing could make a drastic difference in your spendable income during retirement. Not long ago, I came across a retirement calculator that’s awesome AND FREE! Frankly, this calculator is better than some of the high-dollar programs that are constantly being pitched to us financial planners. If you want to check it out, visit NewRetirement. You’ll have to set up an account, but it’ll only take a few seconds. Afterwards, you can save your profile and make changes to the calculations as your personal financial situation changes. Finally, I’m sure you understand that there’s a tremendous amount riding on you getting good answers to your retirement planning questions. If you need my help, I’m still available for a private consultation. You can get started by clicking HERE.